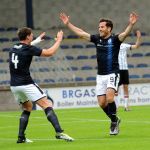 Raith Rovers ended their pre-season in the most positive manner imaginable on Monday evening, with a 3-0 win over local rivals Dunfermline at Stark’s Park. First-half goals from Liam Buchanan and Lewis Vaughan, were added to in the second-period by Ross Matthews, and while the scoreline added some extra sheen to proceedings, it was the dominant performance which was the most pleasing aspect of a physical and competitive fixture. Barry Smith made two changes from the weekend’s win over Clyde, with teenager, Rory Brian starting in goals in place of Aaron Lennox, while James Berry made way for Scott Robertson in the middle of the park. 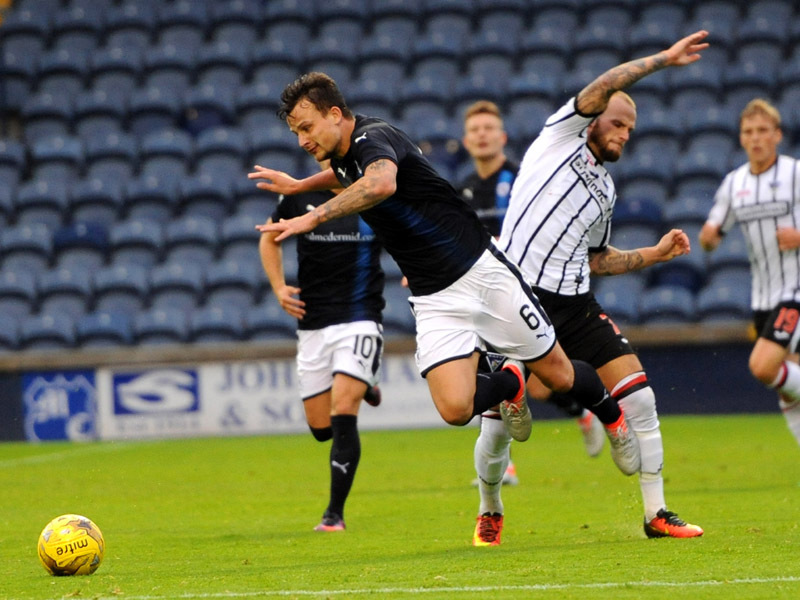 Allan Johnston’s team featured a few Raith alumni, with Joe Cardle featuring in their ranks, as well as the more recent additions of Declan McManus and Jean Yves M’Voto, who both made the journey along the A92 in recent weeks. 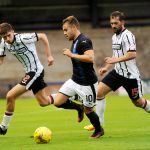 With Rovers coming up against two League Two sides in their previous run-outs, the challenge of Dunfermline seemed a far more onerous task, and the opening few minutes appeared to back that opinion up. Joe Cardle’s cross into the area allowed Ryan Williamson a shot at goal in the game’s opening exchanges, but he failed to connect properly and the chance was spurned, while M’Voto did similar with his header from a Kallum Higginbotham cross after ten minutes, nodding over when he really should have tested Brian. The French defender wasn’t receiving the best of receptions from his former supporters, but the home fans had far more positive things to enjoy the longer the half wore on. Other than the opening period, Rovers had enjoyed the upper-hand over their near neighbours, although it took them until the 20th minute to fashion their first chance. Jason Thomson’s cross from the right was nodded back through the penalty-area by Bobby Barr, and although it eventually found Buchanan at the back stick, he wasn’t quite able to wrap his foot around the finish, sending the ball into the wrong side of the net. His finish three minutes later was far more accurate though. Cardle and Callum Morris got themselves into a bit of a pickle on the edge of their own box, allowing Barr to nip in and hare into the area. Looking up and spying Buchanan alongside him, his cutback allowed the forward to roll the ball into the unguarded net, to notch up his second goal in two pre-season fixtures. 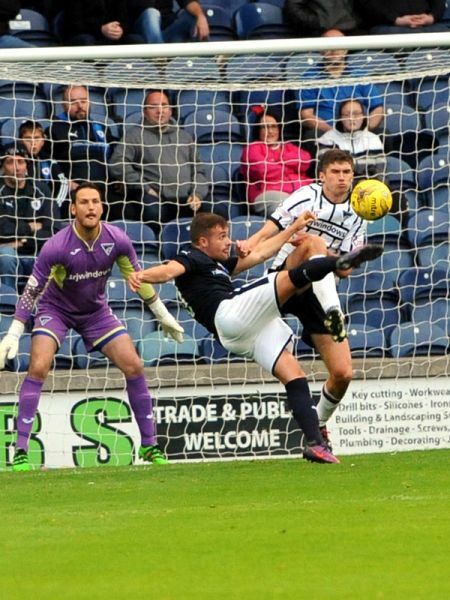 Raith weren’t resting on their laurels though, and they doubled their advantage in the 31st minute. 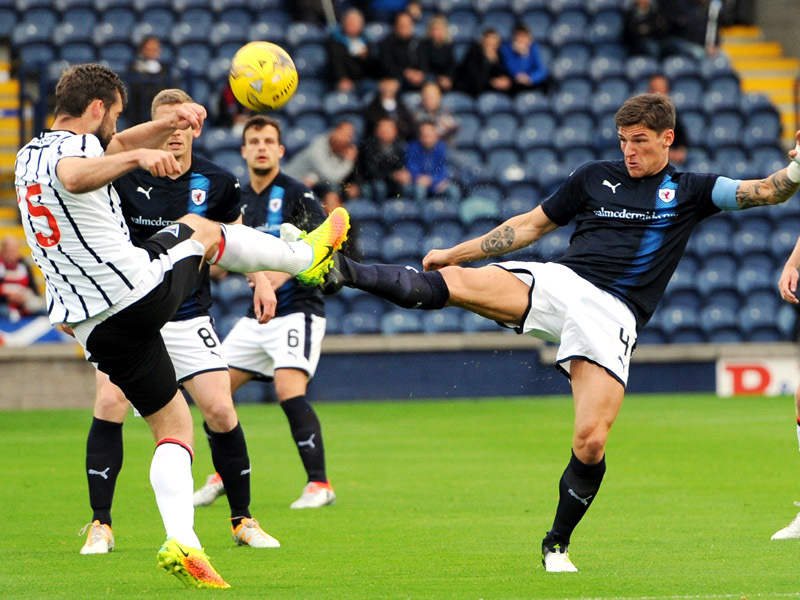 A fine piece of interchange involving Ross Callachan, Greig Spence, Thomson and Barr, saw the winger dig out a cross into the box towards Vaughan, who showed great technique to volley the ball past Sean Murdoch to extend the lead to two. 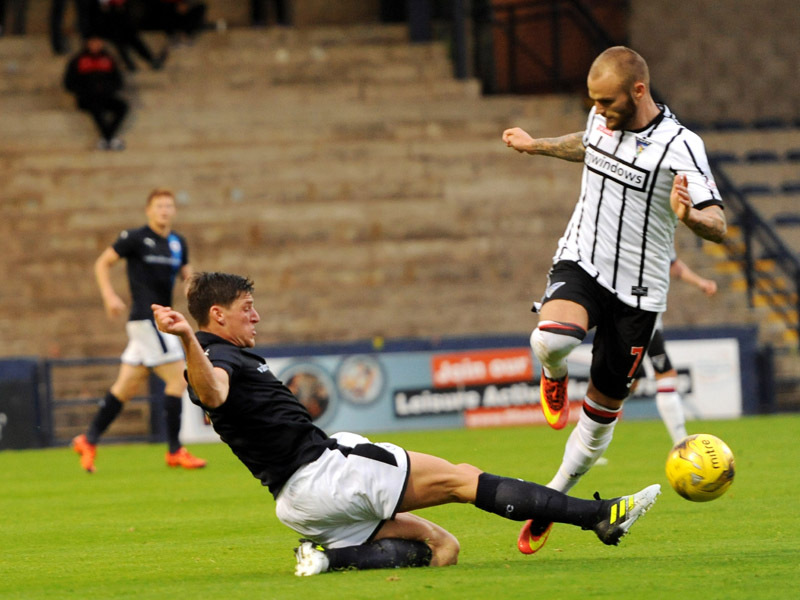 Dunfermline looked somewhat rattled at this point, and while they showed the occasional glimmer of creating something, normally through Higginbotham, McManus and Cardle were being effectively stifled by the Raith defence. 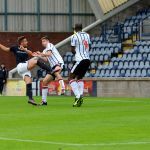 If any other goals were going to arrive, they were probably going to come for Smith’s side, and Vaughan was unfortunate not to add his second and Raith’s third as the half drew to a close, first-timing a Thomson shot narrowly past the left post. 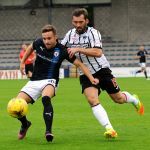 The new Raith boss had used the other intervals to introduce fresh legs into the Edinburgh and Clyde friendlies, but perhaps conscious of the more full blooded nature of this one, the same side which finished the first-half, began the second. 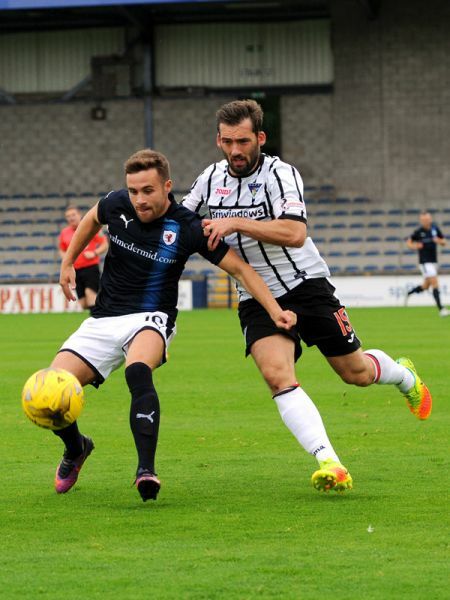 He wasn’t too slow to change things around though, with Ross Matthews trading places with Barr in the 53rd minute, as Dunfermline started with a bit more oomph about them as they kicked towards their own fans. That said, while Williamson was driving them up the park with his galloping runs from right-back, Brian wouldn’t have to save to make until midway through the half, when he easily gathered a Morris header from close-range. It would be the only stop he was required to make all night. Rovers were still looking good at the other end, although the chances were being created with less frequency than before the interval. Vaughan couldn’t quite get his accuracy spot-on with his free-kick from 25-yards out, while Spence fared little better with a shot from a similar distance after combining well with Buchanan. The same two players linked up again with ten minutes remaining, but the result was essentially the same, with Spence’s effort from distance effectively gathered up by Murdoch. 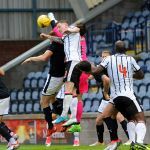 The Pars ‘keeper didn’t have much of a chance with the next long-range attempt though, as Rovers made it 3-0 in the 87th minute. 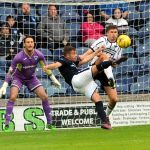 Matthews bullied Michael Paton off the ball in midfield, and after striding forward and weighing up his options, he decided the best choice of action would be to leather it goal-wards, and he was right, as the ball deflected in off the foot of the post to wrap up a comfortable win for the Kirkcaldy side. Welcome to Starks Park, it's 13 degrees and cloudy. 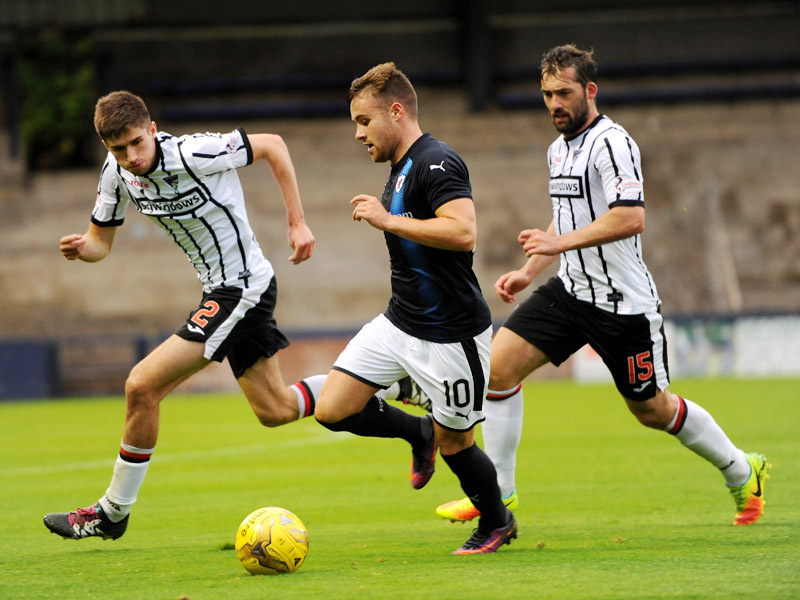 We entertain Dunfermline in tonight's challenge match. The Pars team includes ex Rovers Big Jock, Declan McManus and cup winner Joe Cardle. Trialist keeper comes out and comfortably gathers a header. A slack clearance sees Williamson sneak in but he hits the side net. The ex Rovers players receiving a Starks Park welcome. 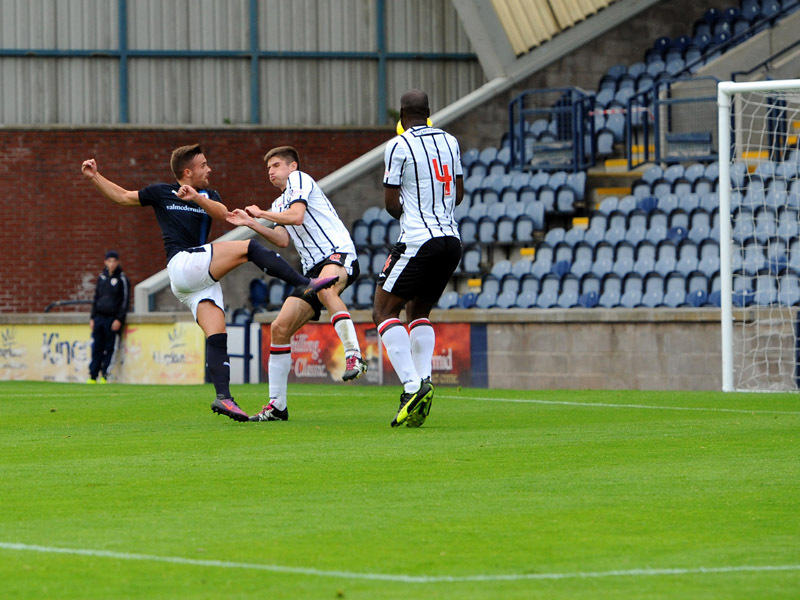 Benedictus rushes back to deny McManus. The ball is recycled from a corner and Big Jock heads over the bar to much amusement. Morris penalised for a half Nelson on Spence. Murdoch coming out to claim a deflected shot from Buchannan. 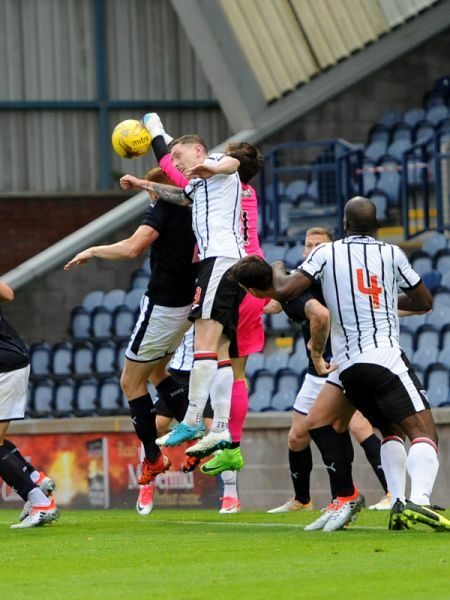 Thomson and Cardle clash, the latter gets up quickly. 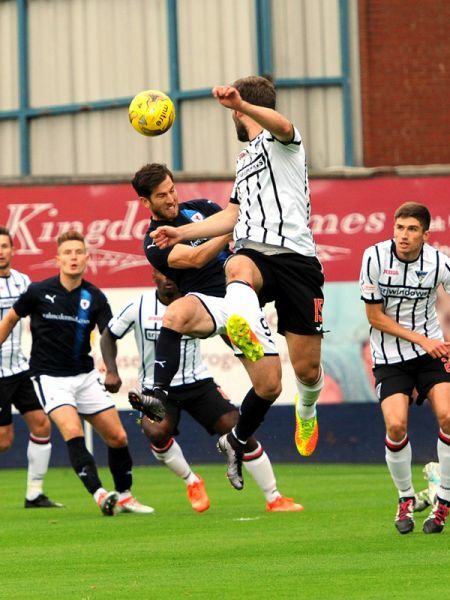 Rovers string some passes together but the Pars midfield is resolute. Barr steams down the left and crosses to Buchannan, Murdoch does enough to clear from his feet. Lovely passing between Vaughan, Buchannan and Spence sees the latter denied, the ball coming back from Barr but goes out. 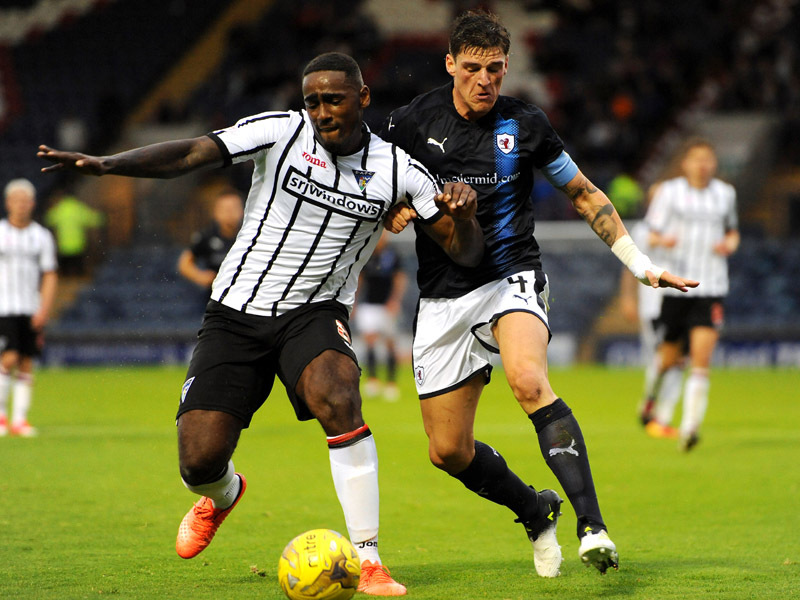 An error in defence and Spence played on Buchannan who scored his second goal in three days. McManus squares to Higginbotham who skies the ball wide. Teasing play from Spence , Thomson then Barr saw Vaughan in the clear and he hit the net from 6 yards. Higginbotham bulldozes Robertson but survived with only a free kick as punishment. Scott Robertson having a good game so far, showing what could have been last season. Cardle goes over Davidson chasing a ball and gives himself a dull one in the process. Vaughan comes close shooting just wide after Thomson delivering a great cross. A great cross from Buchannan forces Williamson to head behind for a corner. Attendance, 1460, 493 away supporters. Errant kicking from Murdoch received great appreciation. Higginbotham and Smith overlap, corner sees McManus head straight to the keeper. Cardle crosses to the back post, Martin sliced the ball into the side net. Wedderburn catches Buchannan from the back, Pars survive with only a free kick conceded. The Pars keeper looks very nervy coming out for a ball. Rovers keeping the pressure on. Vaughan trying an overhead kick but the ball is blocked by Williamson. Vaughan sends his 30 yard free kick just over the bar. Benedictus clips Smith on a run and gives away a free kick on the right. The free kick comes in and the Trialist keeper does well to come out and save. After a spell of possession, Paton breaks the momentum by shooting high over the bar from distance. Spence is released by Buchannan and runs 20 yards before tamely shooting just wide. Cardle delivers a long pass from the left to............no one. 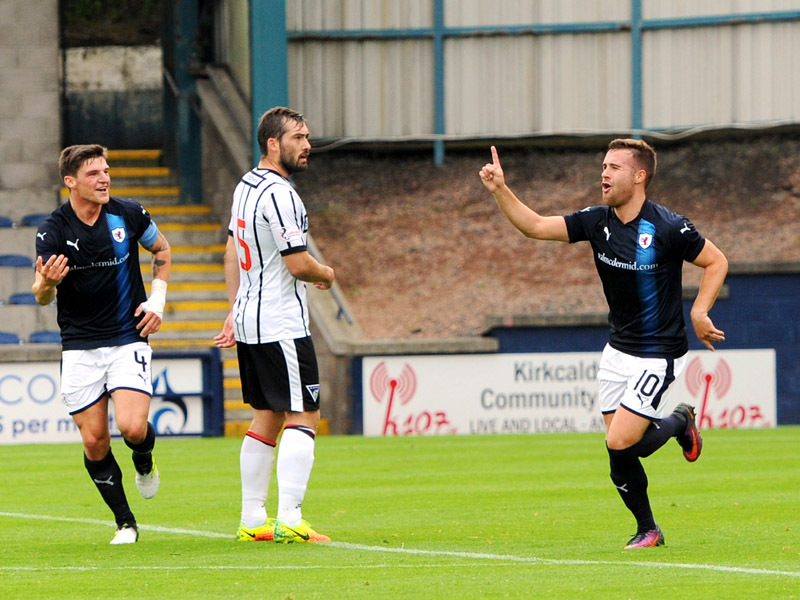 Latest score, Raith Rovers 2-0 Dunfermline Athletic. Buchannan gets the better of Big Jock and wins a corner. Higginbotham brings down Benedictus, which were it a competitive game would have seen a card. Buchannan releases Spence who fired low from 25 yards straight to the keeper. Higginbotham fancied a dig from outside the area and sent the ball just over the bar. McKay and Oesi ready themselves. Davidson and Spence off for the aforementioned. Osei on the prowl chasing down the ball but Murdoch clears. Ross Matthews received the ball from Robertson and struck from 20 yards the ball going in off the post. Vaughan has a pop from 20 yards. 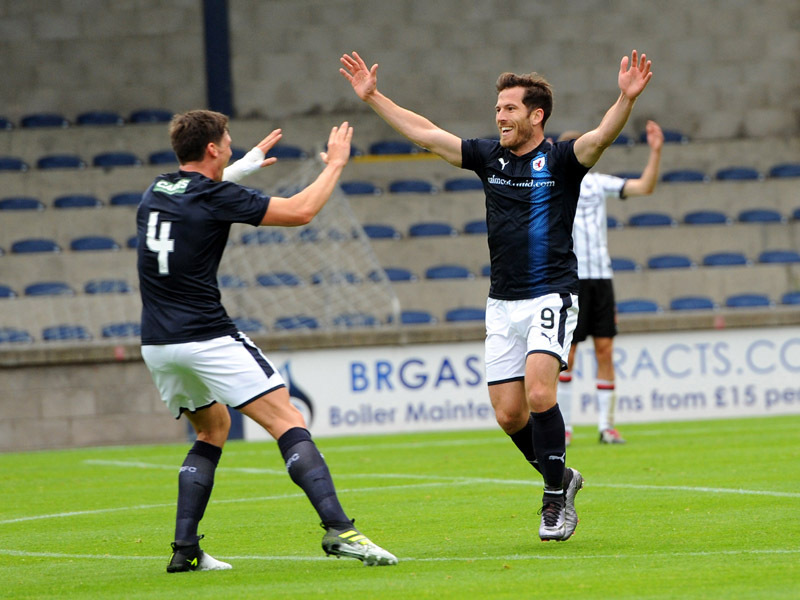 +1 Full time, Raith Rovers 3-0 Dunfermline Athletic. Trialist, Thomson, Callachan, Murray, Benedictus, Spence, Robertson, Buchannan, Vaughan, Barr, Davidson. Subs, Lennox, Matthews, McKay, Court, Berry, Trialist, Trialist. Murdoch, Williamson, M'Voto, Morris, Martin, Splaine, Wedderburn, Cardle, McManus, Paton, Higginbotham. Subs, Gill, Ashcroft, Morrison, Duthie, Lochead, Smith, Luke.